It’s a seductive lady (or, in Erica’s case, a hunky neighbor) that peers over from across the room like a new arcade game being plugged-in, lit up for the beginning of an unforgettable string of nights together. It’s new and fun at first, but, if you’re not careful, she’ll knock you right out of your senses. She’ll have you scrounging high and low (emphasis on low) to keep going. Not even Abraham Lincoln can save you with his luck. The video game arcade was archetypal of the 1980s and Adam and Barry were rendered as shocked as the reality that there were “high-definition” animations inside the games. The trouble is when this digitally mastered past-time translates beyond the doors of the gaming wonderland and overtakes your every thought and every reaction. So much so that your younger brother’s prized possession can be traded-in for scraps (well, fifty cents anyways). What would Han Solo say? Like a favorite arcade game, that first crush has the same effect in terms of dominating our every sense and every thought. An uncontrollable power unlike most anything else in this world, we are at the beckon call and mercy of our love. But, as Erica tragically discovered, that guiding light of her life that stemmed from a varsity jacket was as fickle as a coach’s starting lineup. The break-up. The breakdown. The über rational and scientific indicator for knowing how to feel in situations like this. Living in the second decade of the 21st century virtually requires a digital footprint on a seemingly infinite grid. There are savvy gadgets, innumerable apps and convenient computers for the desk, lap and hand. The cloud is above us, next to us and in front of us (though sans a reliable, visible presence) every hour we allow that bright glow to permeate through during an intimate dinner conversation or while our eyes are attempting to close for the night. There is always something to read, something to know and someone to text. Admittedly, the latter is a tremendous feature on our phones, bridging a communication gap with casual conversations here and there throughout the day. Regardless, when did this happen? Why did we surrender ourselves to the pursuit of endless data? Collecting information is not good or bad in absolute terms, but it does distract us from the natural evolution of ourselves and our surroundings. Every so often, we need to break our technology-centric pattern and wake-up like it’s the 1980s, void of that bright shining light in order to refresh what “data” we really should be absorbing (do I really need to watch every interview with Steven Spielberg tonight? ), experiencing and using to help ourselves and the people we care about. Shouldn’t we be prioritizing our limited time with the people we hold dearest? Ironically, whether in 2014 or 1980-something, we just need to unplug. Having a shouting sidekick like Beverly Goldberg doesn’t hurt either. Plus, the wind can randomly and perfectly lift and hurdle a garbage can through the windshield of a former boyfriend’s car. The Goldbergs reminds us of a simpler time with entertaining stories of how we all struggle with life and our place in it (and the occasional addiction) during our most comically awkward years. Thankfully, human nature and our personal limitations eventually prompt us to turn off our gadgets for a little while or to realize the true price of pawning our younger brother’sMillennium Falcon for a couple plays at Punch-Out!! at the nearby arcade. Turns out, it was a signed Moses Malone jersey (ouch!). This personal awareness can also open the door for father Murray Goldberg to finally help his daughter in a very real way with her ailing, broken heart. It’s astonishing what can transpire when we allow someone to show us a helpful, glowingly inspiring alternative. Like being on the receiving end of a punching bag, there are days when we couldn’t be happier to take a hit for our family. Once again, The Goldbergs proved the ’80s was a fantastic decade with another heart-warming and entertaining KO. Randomness is a mysterious, yet powerful force that can yield not much of anything. Or, it can produce something in the neighborhood of accidental brilliance. Maybe (and hopefully), the following idea will somewhat resemble the latter. 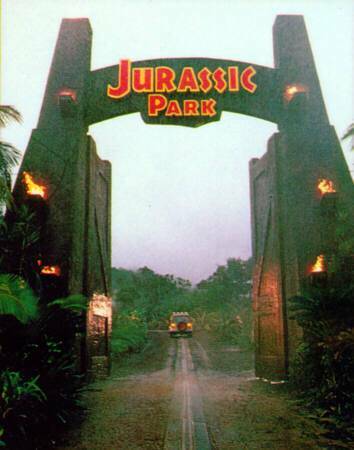 While listening to the first few minutes of the Jurassic Park soundtrack at work on YouTube this morning, the perfectly composed instrumental by the legendary John Williams inspired a thought as crazily insane as a modern-day park on an island filled with dinosaurs brought back to life from 65 million years ago. What about a new ride at Universal Studios Orlando called Jurassic World that would coincide with the release of the 4th installment of the popular movie franchise that let’s intrigued visitors starting at age 10 or 11 pick 1 of 3 levels to walk (and run!) through while being hunted and pursued by a variety of dinosaurs!? Depending on the level of adventure (1=easy going with a surprise or two, 2=ready for an adventure with dramatic surprises and 3= a kitchen-caliber experience), the participant or small group of participants would be briefed on what task they need to accomplish in a 2-minute time period by a distressed character in the park. The technology would be a combination of animatronics and virtual reality, depending on the selected level and the viability of realism and operating such machines on a constantly rotating schedule. However, the environment, movie set surroundings and dramatic music would be perfectly authentic and real. Contingent upon the level selected, each participant will or will not be equipped with a weapon to defend themselves. Plus, the experiences on each level would change after a certain amount of time as to keep people who come back more than once guessing and in suspense. Any young children under a predetermined age by Universal officials would need to be accompanied or joined in their adventure by a parents(s)/uncle/aunt/grandparent/older brother or sister, etc. This is only an initial suggestion that would require countless variables to be considered and worked out (yes, more so than in the movie). Regardless, would you get in line? This personal/group thrill ride would take the existing Jurassic Park attraction in Orlando a step further by fully-injecting people inside Jurassic Park/World without the restriction of a car. Fans would experience the world of Jurassic Park like never before. Jurassic Park ushered in a new era of special effects for multiple generations of moviegoers and fans, so it seems only fitting that Jurassic World also usher in a new era of special effects for multiple generations of moviegoers and fans. Jurassic World: will you get into it? That would be Goal of the Year Goal of the Century. We Are The 5th Line! This will be an eventful weekend for stand-up comedy. First, Aziz Ansari will be performing his new stand-up, Modern Romance, at the Palace Theatre in Columbus, Ohio. Then, on Sunday night at 10:00 p.m., Comedy Central will premiere Jim Gaffigan’s new comedy special, Jim Gaffigan: Obsessed. Until then, it is Friday and if this blog can offer just one piece of advice for today and the weekend ahead, it’s this: avoid kale. His perspective on this vegetable is as sound as his perspective towards Hot Pockets. Kale, your days are numbered.